There is a school of thought that music should only be classified into two types; good and bad or that which you like and that which you don’t. However for those genre junkies out there, here’s a new one to throw into the mix. Take the sincerity of country, the classical interpretation of folk, add a touch of the resolute realism of urban rock, sprinkle the minimalist approach of roots music and the result is a new genre hypothetically unveiled as ‘Urban Twang’. This is the perfect classification for those who consider the singer-songwriter genre to be too simplistic and Americana one too vague. 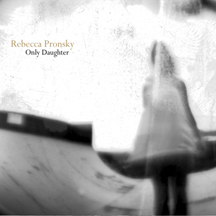 While the opening gambit of this review can be construed as a touch pretentious, all the factors indicated are the essential ingredients in the new album ONLY DAUGHTER from New York based singer-songwriter Rebecca Pronsky. This is her third release under the Nine Mile Records label and one that she can be very proud of. Coming quite quickly after 2011’s VIEWFINDER, Rebecca has continued to hit the mark with an impressive outpouring of her creative talents across the ten tracks that form the record. These talents include the song writing credits for all but one of the songs on the album. The odd one out being a number originally written and performed by fellow American artist Mark Kozelek and given the curious title ‘Glenn Tipton’. On the surface this profound song seems to have little connection with the Judas Priest band member named in the title but is a much analysed piece online and Rebecca’s rendition is a highly commendable version of a heavily folk inspired song. With analysis of the cover out of the way, attention turns to the wealth of self penned songs that give the album vitality and strength. The rousing ‘Rise Up’ with its protest connotations gets the album off to the perfect start before leading into the melodic ‘Honesty’ that continues the infectious beat to carry the momentum forward. Fellow New York artists, the mother and daughter duo Suzzy Roche and Lucy Wainwright Roche add vocals to ‘Better That way’ a song enhanced by the subtle banjo touches that adorn the opening number as well. Rebecca’s husband, Rich Bennett, is one of the driving forces behind the album, combining guitar, keyboard and ukulele input with the production duties. The essential pedal steel is provided by guest musician Mike Nolan adding a hint of twang to ‘Glenn Tipton’ and ‘Honesty’, while the permanent band’s engine room is steered by Dan Shuman on bass and Russ Meissner on percussion. In addition to her acoustic guitar and lyrical contribution, Rebecca’s vocals grace each track in true unmistakable Americana style effortlessly switching between the jaunty numbers and the slower ones such as the dreamy ‘Come Down’. This perfectly supplements the rock inspired song ‘The Garden’ where the production steps up a notch from the more minimal roots tunes. The highlights of this first class album are a toss-up between the inspiring ‘Rise Up’ and the jolly show-closing ditty ‘Please Forget Me’ with its upbeat feel reminiscent of that nostalgic Broadway sound. In truth there isn't a bad track on the album, which will neatly fit into an economical half hour gap in our busy lives and will surely be the centrepiece when Rebecca returns to the UK for some shows in March. 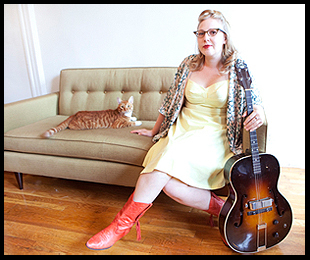 If the hypothetical ‘Urban Twang’ is going evolve as a genre let’s add Rebecca Pronsky to some of the founding members such as Mary Chapin Carpenter, Gretchen Peters, Justin Townes Earle and Nell Bryden to name but a few highly respected and influential artists. Grand company I’m sure you would agree but ONLY DAUGHTER confirms Rebecca Pronsky’s place alongside these performers.